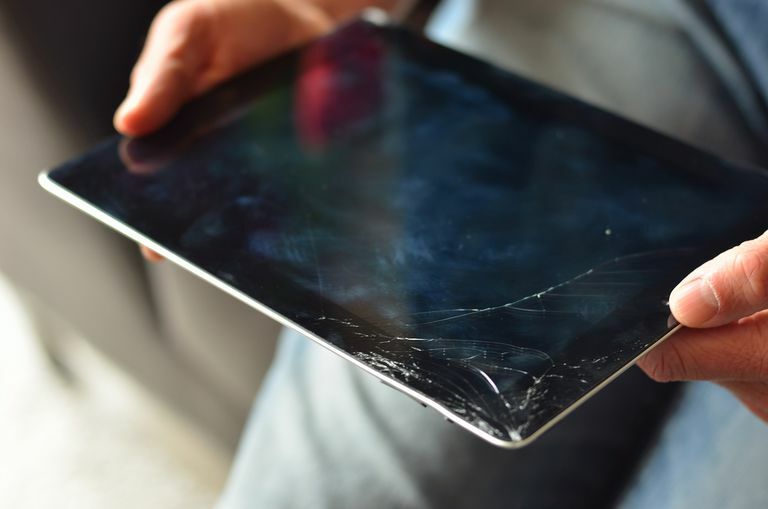 What Should You Do With a Cracked iPad Screen? Believe it or not, the iPad can still function with a crack in the screen. It can even work if the display is shattered, although it may be tough to actually read the text on the screen. But unfortunately, getting that screen replaced isn't cheap. Apple has a set fee based on the model of the iPad, and while getting the screen replaced on an iPhone isn't too bad, this is one area where that big display is a drawback. The cheapest screen repair for an iPad is $199 for the iPad Mini or iPad Mini 2 and the prices go up from there. The iPad, iPad 2 or iPad Air will cost $249. The iPad 3, iPad 4, iPad Mini 3, iPad Mini 4 and iPad Air 2 screen replacements cost $299. The 9.7-inch iPad Pro has a $379 price tag for the screen replacement and the 12.9-inch iPad Pro costs $599. You may find a better deal at a third-party repair company, but if you get your screen replaced by Apple, the screen will be covered by a 1-year warranty even if your iPad is out of warranty. This means any trouble with the sensors in the screen several months down the line won't incur any additional repair costs. The same can't be said of most third-party repair companies. Did you decide to go with Apple's extended warranty for your iPad? If so, you are in luck. One of the best features of AppleCare+ is that it covers accidental damage -- including a cracked screen—for a reasonable service charge of $49. And the screen replacement itself is covered on a one-year warranty, so if you get it replaced but Touch ID no longer works, they'll do a second replacement free of charge. And when you consider that screen replacement can cost hundreds (plural!) of dollars, the $49 service charge you will pay is quite cheap in comparison. You can schedule an appointment with Apple's Genius Bar at your nearest Apple store or you can mail your iPad to Apple to get it fixed. While Apple's 1-year warranty doesn't cover accidental damage, some hairline cracks may be considered a flaw in the display. So if your iPad is still within warranty, it's a good idea to take it to the nearest Apple store to see if it is covered. Remember, this has to be a very small crack, so if your screen is shattered, you won't have much luck. Another option for small cracks is not to do anything at all. If it isn't covered by Apple, it may be better to continue using the device rather than pay an expensive screen repair. If you choose this option, you might invest in a hardier case that includes a plastic screen protector. It is important to remember that a small crack can grow and eventually turn into a shattered screen. However, the screen replacement is a set fee. It will cost the same to replace a screen with a small crack as it will to replace a screen that is shattered, so if you think you can live with the crack, it won't cost anything additional to repair the screen if the crack grows. You still have options even if the crack is quite sizable or if the screen is completely shattered. In fact, some people still use their iPad even with a shattered screen. You'll definitely want to wrap your iPad in a case that includes a screen protector as much to protect your fingers from cuts as anything else, but so long as you can see what is on the screen, you can limp by with a broken screen. This is an option mainly because screen repair can be expensive. An iPad Air 2 will cost $299 for a screen replacement and $399 for a brand new one. And you should be able to buy a used iPad Mini or iPad 2 -- two of the most popular iPad models ever sold—for cheaper than it would cost to replace the screen. You can also downgrade your iPad. This really works well if you have a 9.7-inch or 12.9-inch iPad and wouldn't mind stepping down to the smaller 7.9-inch iPad Mini models. The bigger the screen, the more expensive the repair. After all, it costs more to repair an iPad Air 2 than a brand new iPad Mini 2. You can also sell your iPad. Just because the screen is shattered doesn't mean it is worthless. In fact, if you check the sold listings on eBay for iPads with a cracked screen, you may find it is better to sell the broken iPad and then use the cash gained combined with the cost a screen repair would have cost to buy a replacement. You might even be able to use the cash for the broken iPad to buy a more powerful iPad for less than that screen replacement. You can schedule an appointment at the Apple Genius Bar by visiting the Apple Genius Bar webpage and clicking the "Get help now" button. After you choose that it is an iPad, that it has physical damage and that the screen is cracked, you can schedule an appointment. You can also use this method to call Apple support or have them call you if you don't have a certified Apple repair location near you and need to send your iPad to Apple. Is AppleCare+ Really Worth It? Does Your iPad Have a "Green Screen" Problem? Fix It! My Nintendo 3DS Hinge Cracked! What Should I Do? Is it Really a Good Idea to Jailbreak Your iPad?